December 5th is the International Volunteer Day for Economic and Social Development, and we have the perfect book for that! As the world around us gasps for breath in an environment of unprecedented complexity and need, we find ourselves overwhelmed and asking if there’s anything we can do to make a difference. This book answers with a resounding “Yes!” and serves as a practical guide to help readers discover their passion and develop their personal plan to make a world of difference. Get inspired to make a change in your community. 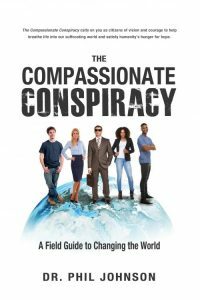 Check out The Compassionate Conspiracy: A Field Guide to Changing the World by Dr. Phil Johnson. This book will give you tools and motivation to take action and help the world, whether on a smaller or global scale. Pick up a copy today from your favourite book retailer.